U Win Tun may not have had his face emblazoned on T-shirts sold for Westerners outside Yangon’s tourist shopping mecca of Scott Market, but for the Burmese, he was one of a trio of democratic heroes, just as iconic as Daw Aung San Suu Kyi and Min Ko Naing, having spent nineteen years in prison for his involvement in the 1988 revolution. Then in his eighties, his frail figure dwarfed by the chair he sat on, he mesmerized the Pearl Room of the Asia Plaza Hotel in Yangon with his love for books; how when he was a child books spurred him to become a journalist; how in prison books were banned by the jailors; how scraps of papers with letters became novels in his free imagination. Flanking him were two people with very similar stories; Dr Ma Thida (Sanchaung) political activist and writer, jailed for four year in the nineties and blogger Nay Phone Latt, sentenced to twenty one and a half years for ‘creating public alarm’ by reporting on the 2007 Saffron Revolution. In fact, a lot of the people in the room that day had breathed U Win Tun’s memories. 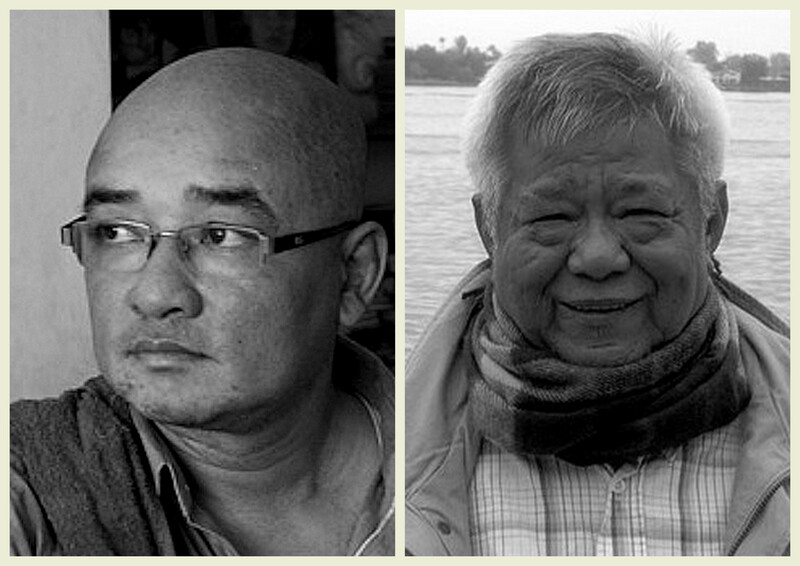 On my table alone, there were two ex-literary prisoners and a former exile: Seyar Lay Ko Tin, sentenced for 4 to 10 years for possession and distribution of censored materials in the 1970’s under the Ne Win era; poet and installation artist Saw Wai, imprisoned for his infamous 2008 Valentine Day poem which criticized General Than Swe; and poet-translator U Zeyar Lynn, forcibly relocated from Yangon to Upper Burma. 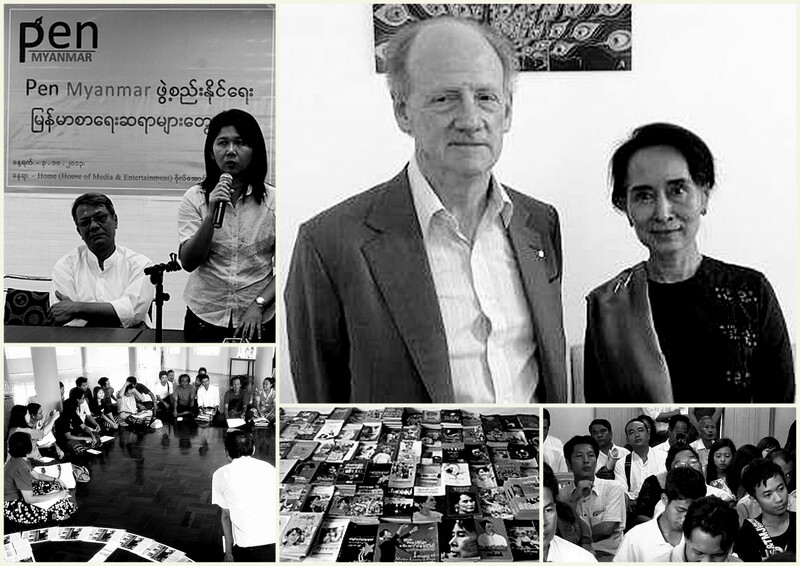 But then, such a roll call of literary giants was to be expected when the event was to officially announce the new chapter of a literary organisation once so despised by the military junta; PEN Myanmar. Inconceivable as little as a year ago, the event was an historical occasion, for many of those present had won PEN Freedom awards during their imprisonment. For me, however, the afternoon took on a more personal significance. It was the afternoon when, almost by accident, I was gifted a pen name. The use of alternative names is not just reserved for writers in Burma. Unlike in the West, Burmese do not use surnames, and often use astrology to name their children, corresponding to the day they were born to the consonant that represents that day; which accounts for the propensity of Aungs and Kyaws amongst ethnic Bama men. People will also use numerology and horoscopes to forecast their lives. If a negative future is viewed, then a simple change of name will divert the bad luck. In other regions of Burma such as the northern Kachin State, clan names are prevalent resulting in several ‘Bawk’s in a single room. In in the east, most Kayin men you meet will be called ‘Saw’ meaning ‘Mr.’ but used as integral part of their name; on passports and national registration cards. A few months ago I conducted a short story workshop in Mawlamyine, the capital of Mon Sate in which every participant, man and woman, had ‘Mon’ in their name. It’s no surprise then that most Burmese employ multiple titles, if only to distinguish themselves from their neighbours. Yet it is a practice which even foreigners in Burma have adopted. Eric Arthur Blair most famously took an alter-ego to heart; writing ‘Burmese Days’ under the authorship of George Orwell. 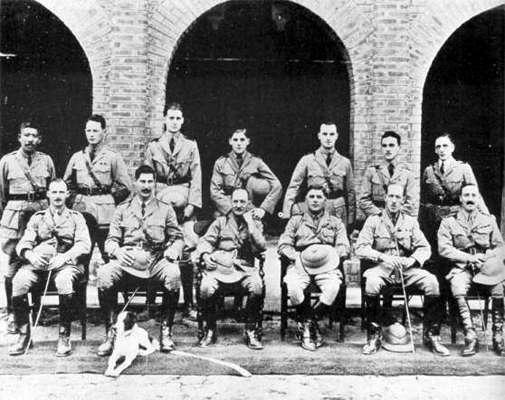 Mr Orwell may possibly have been influenced by Hector Hugo Munro, a Scot born in Burma in 1870, employed as an imperial policeman – like George Orwell – before going on to write short stories under the pseudonym Saki. J. G. Scott, a man who devoted most of his life to Burma and its people, wrote his seminal ‘The Burman: His Life and Notions’ in 1882, under his given Burmese name, Shway Yoe. Then of course, there was Nefaltí Ricardo Reyes Basoalto, Chilean Honorary Consul to Burma in the 1920’s, probably better known as the poet Pablo Neruda. Foreign writers in Burma have carried this inclination over into the 21st century, with Emma Larkin aping the object of her quest in her excellent book ‘Finding George Orwell in a Burmese Teashop’; Emma Larkin not being her real name. 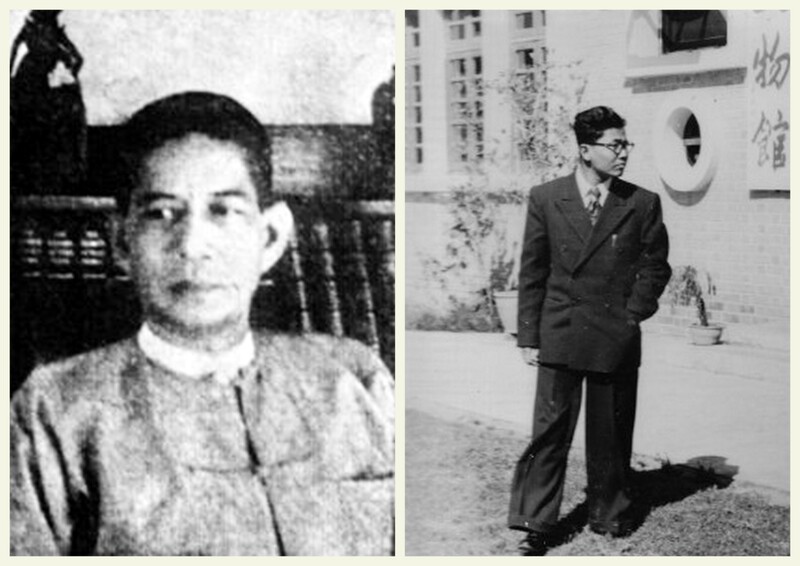 Among early Burmese writers, the practice of taking a pen name was a natural path to take considering the ease and familiarity at changing names in their public life. The use of literary pseudonyms can be found at the birth of modern Burmese literature. The first recognised short story published in Burmese, ‘Maung Thein Tin, Ma Thein Shin Wuthtu’, printed in Thuriya Magazine, volume 1, no.1 in March, 1917 was written by Shwe U Daung. Shwe U Daung is perhaps more famous in Burma for his detective stories based in large part on Sherlock Holmes; his Burmese Sherlock U San Sar complete with longyi and living on his own version of Baker Street – 38th Street, Kyauktada Township. Other modern literature pioneers of the early 20th century followed, with U Sein Tin, better known as Theippan Maung Wa, depicting the lives of ordinary villages through his short stories using the experimental ‘wuthtu saungbar’ style; narratives based on real people or events with a loose fictional plot and dialogue. Thein Han, an early proponent of the ‘khitsan’ movement – literally ‘testing times’; a fundamental shift in literary focus away from courtly prose, Buddhist scripture and national myths to lives and words of the common people – ironically, wrote poetry under the name Zaw Gyi, an anthropomorphic sorcerer of Burmese legend. And then there is Dagon Taya, as close to a national bard as is possible in a country like Burma with such a legacy of literature. Passing away at the grand age of 94 only in August 2013, Dagon Taya, born Htay Myaing, was a poet, a story writer, an anti-imperialist campaigner, leading member of the 1930’s khitsan movement, Independence day speech writer, national literature award winner, political prisoner and ultimately an exile, removing himself away from the attentions of the New Win government in the 1970’s to the small town of Aungban in Southern Shan state and disappearing from public view. He was also a man of many pen names; at least 7. 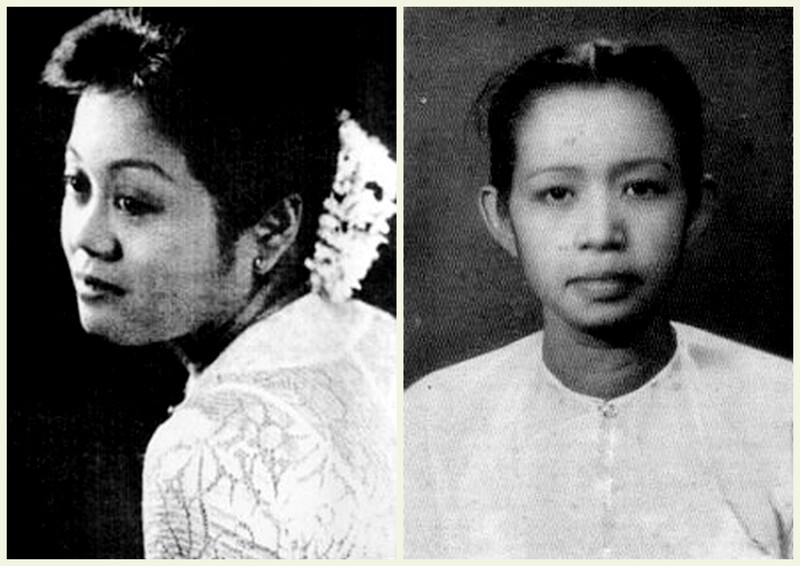 The post war period saw the rise of Burma’s golden generation of female writers. Ma Khin Mya, often called the ‘grand dame’ of Burmese literature, wrote under the pen name Daw Khin Myo Chit. Her fist novelette ‘College Girls’ appeared in the 1930’s and she continued writing up to her death in January 1999. Writing in English, her short story ’13 Carat Diamond’ published in 1956, was later included in the Bantam Classics ‘50 Great Oriental Stories’. This great tradition of female writers and pen names continues to this day in Burma with the likes of Cho Cho Tin (Ma Sandar), and Nu Nu Yi (Inwa). Of course, in a country like Burma, the reasons for the popularity of aliases amongst writers aren’t simply down to the fluid customs of name giving and taking in Asia. In a country like Burma, with its recent history of censorship, imprisonment and general abandonment of freedom of speech and expression it was never a bad thing to write under a name which had no physical connection to you. This was certainly the case with Dr Ma Thida (Sanchaung), who published her documentary fiction ‘The Roadmap’ in Thailand under the name Suragamika, which roughly translates as, ‘Brave Traveller’; a suitable moniker giving the context of the book (it is set during and after the 1988 revolution following the lives of one family whose father had been imprisoned). Maung Thura, writer, comedian, democracy activist and a constant thorn in the military junta’s side goes by the name of Zarganar, in English, ‘Tweezers’. Having a pen name can distance the writer from the words, can protect themselves and their families from the scrutiny of the feared special police, but often the writer cannot distance themselves from the name. The poet Maung Ba Gyan is a particular favourite of mine. When I came to Burma, I stenciled a three line poem of his onto the wall of my lounge, ‘The Great Guest’, he left Burma in 1999 never to return, yet before he died in a Californian exile in 2007 he continued to write and publish as Tin Moe. Often the use of a pen name in Burma goes further than self-preservation. Simple realities of the literature industry in Burma dictate that poets and short story writers must submit their work under different guises. A poem can fetch as little as 5 dollars; a short story, if the writer is lucky, maybe 10 dollars. To survive on your writing in Burma – which many writers don’t, having second day jobs as editors or language teachers – means multiple submissions. But like any publishing industry, editors are wary of over-selling a single author; so a writer will adopt several names. I once met a writer who had forgotten how many names he had submitted work under, he guessed about twenty but he wasn’t sure. Most writers here I speak to say about five is norm. 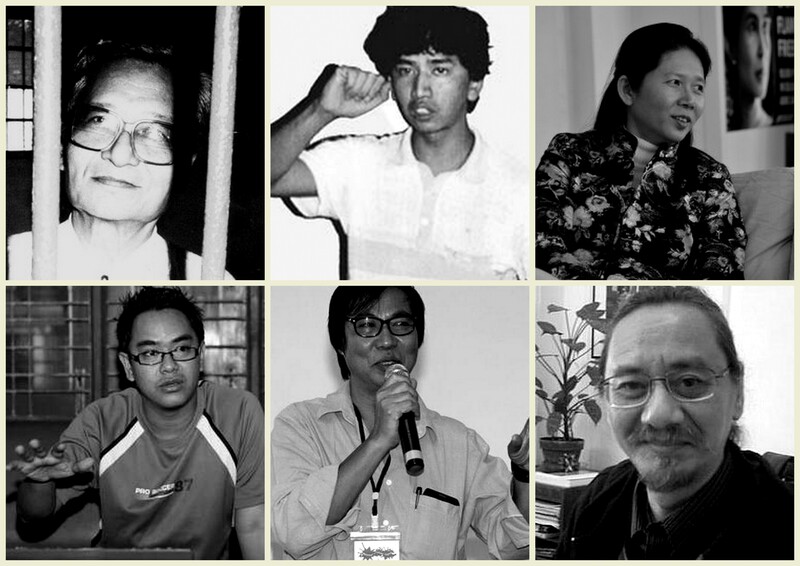 Which begs the question, how do writers in Burma choose their identities, if so many must be utilized? As the only Westerner on my street, it’s safe to assume that everybody knows who I am; knowing who everybody else is, is trickier. Even those who have lived on the street all their lives often refer to their neighbours, not by name, but by physical or habitual characteristics that have morphed over time into the standard name that everyone uses. For example, the old Chinese man who spends his days sitting on his front step smoking, is known simply as ‘old Chinese man’, the curiously obese boy who plays street football every night is called, cruelly, ‘fatty’, there is also ‘skinny man’ and ‘tall man’. The last foreigner who lived on my street in the mid 80’s, a British Embassy employee, was affectionately known as ‘Uncle Poori’ due to him eating poori every night in the Indian restaurant on the corner. Nobody remembers his real name. While not many Burmese writers fashion aliases around their height or weight, there are commonalities to most. Attaching the name of the journal they publish has been a popular method since the early 20th Century. 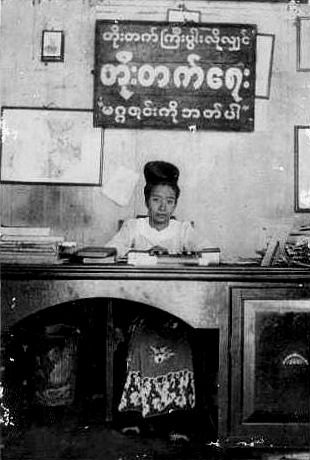 Khin Lay Latt, arguably the greatest of the pre-war female writers in Burma, wrote as Dagon Khin Khin Lay, after her magazine of the same name, ‘Dagon’, ‘The Star’. Her post-war successor, Ma Ma Lay, wrote one of only two Burmese novels to be translated into English, ‘Not Out of Hate’, though her biography of her husband ‘A Man Like Him”, translated and published in America in 2008, is without doubt one of the most heartfelt pieces of Burmese literature in English. Right through the war she published a magazine with her husband, the title of which, ‘Journal Kyaw’ (Brave Journal), she prefixed to her name to become, ‘Journal Kyaw Ma Ma Lay’. Ludu U Hla, the great Mandalay publisher, writer and collector, most famous for his series of interviews with prisoners in the 1950’s, ‘The Caged Ones’ simply attached the name of his printing press, ‘Ludu’. In rare circumstances, the journal itself will decide to bestow its name upon a worthy writer. Depending on the quality of the journal, this is about as big an honour a writer can receive in Burma. ‘Shwe Amyutay’ is without doubt the leading literary journal in Burma, to have a short story included in their edition is the sign a writer has ‘made it’. In fact, competition is so fierce that the journal actually has a two tier selection criteria; to even be considered for inclusion in the journal, a writer must have published at least two stories in its smaller, less critical sister edition. Eight years ago, a young woman writer called A Phyu Yaung, translated as ‘white’ or ‘pure’, having spent two years in careful deliberation on her pen name, was distraught to find another writer had successfully submitted a story to ‘Shwe Amyutay’ under the same name only weeks before her. The Chief Editor, in a decision which caused ripples in the Yangon literary community, authorized A Phyu Yaung to affix ‘Shwe’ or ‘Gold” after her name, thereby associating this young writer – and only this writer – to his journal. Most pen name constructions are less dramatic; some like ‘U Phone’ (Chemistry) denote their university major, others are less specific, such as pre-war writer ‘Paragu’, which simply means, ‘The Expert’. Many Burmese writers choose a place of special importance to them; Dr Ma Thida places ‘Sanchaung’ after her name as this is the Yangon township where she was born; Nu Nu Yi chose ‘Inwa’ as this was the name of her university hall where she started her writing career; Naing Swann uses a combination of a location and abstract referencing, writing as Thway (Sagaing), ‘Thway’ meaning ‘blood’, a respectful allusion to her father, the famous detective novelist Sagaing Ei Lwin and ‘Sagaing’ the area in Burma she grew up in. However a Burmese writer chooses their pen name, once they are in possession of one, it will become the name by which, for all intents and purposes, they will die with. They will introduce themselves by it, sign by it, biographies and news articles will refer to them by it. Only their passports (if they have one) and national registration card will bear their real name. Just like the neighbours in my street, often writers who have known and respected each other for years will not know each other’s real name. Working recently with A Phyu Yaung (Shwe) it was necessary for me to book an air ticket for her. Feeling embarrassed at not knowing her real name, I trawled through my correspondence with her; emails, articles, an old application form for a workshop, I could find no mention of it. I called a writer friend, who also didn’t know, I called a second writer with the same results; at one point there was the real possibility of contacting somebody who apparently knew A Phyu Yaung (Shwe)’s mother who surely would have known. In the end, the editor of ‘Shwe Amyutay’ magazine delved into his database and came up with her real name; Yee Kyaw. As a founding member of PEN Myanmar, it was A Phyu Yaung (Shwe) who steered me towards the table I was sitting on. Recognizing only some of the writers and publishers present, I asked Seyar Lay Ko Tin who else had come. Leaning his small frame closer to me he pointed to several distinguished members of the Burmese literary community; U Win Nyein, the Chief Editor of ‘Shwe Amyutay’; short story specialist Ye Shan; the poetess Pandora. Eventually he pointed to a middle aged man sitting on the table across from us. “Mr. Brown?” I asked recognizing the colour in Burmese. “Why on earth is his pen name Mr. Brown?” I asked again. “But everybody is brown here,” I protested.